Joyful Noise is an educational outreach program of the Presbyterian Church of Morris Plains, New Jersey, founded in 1968. Our mission is to provide the children of the extended community a high quality, developmentally appropriate, educational program rooted in the fundamentals of our Christian Faith. Excellent kindergarten preparation including Science, Technology, Engineering, the Arts, and Math. 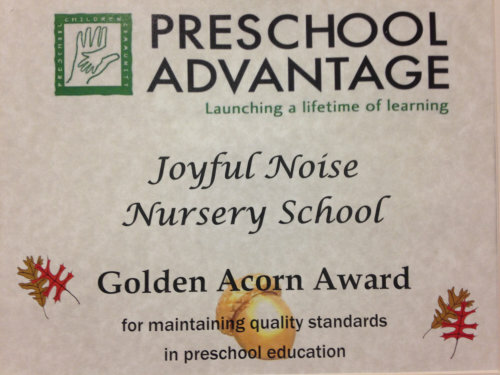 Golden Acorn Award Click here to view more info on our Golden Acorn Award! Click on the pink tab on the left for the 2018-2019 school calendar!